Finally. An Uncle Mike’s size-15 IWB. I’ve been trying to find one for a while now. Every time I wanted to buy one, all the right hand ones were sold out and I’m not left handed. I’ve had the size-1 for my .380 for a couple years. I really like how thin it is. It’s not much thicker than a shirt and it’s comfortable in my waistband. I wanted a size-15 for my 9mm because all the other IWBs I’ve tried were stiff and they would pull my waistband too tightly around my guts. 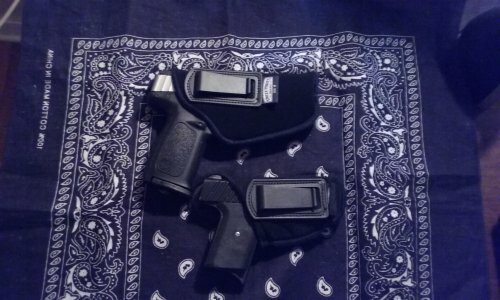 A concern people have about carrying larger pistols in thin holsters like these is the holster will not be strong enough to hold the pistol. That might be true if you’re carrying outside the waistband in a thin holster. But these holsters go inside the waistband. They’re held between your body and pants, and they’re clipped to the waistband. They’re not going to fall. I’m telling you, with this holster I’m very comfortable carrying my 9mm in my waistband. It doesn’t feel much different than a tucked in shirt. I knew this was the holster I needed and I was right. If you’re interested in Uncle Mike’s IWB holsters, first go to unclemikes.com and use their Holster Finder. From there, you can look up hundreds of pistol makes and models and the site will tell you which size holster is right for your pistol.